Trotters Ridge is a beautiful community located off Butternut Road, between Central Avenue and Orangeburg Road, in Historic Summerville, SC. The large homesites afford homeowners the ability to have a comfortable sized home with large back yards and spacious distances from your neighbors. Trotters Ridge is limited to 83 homesites containing a varity of custom built homes, making it a warm and friendly community. Another unique feature of Trotters Ridge is the spacious Park Area, designed to allow various activities for the homeowners. 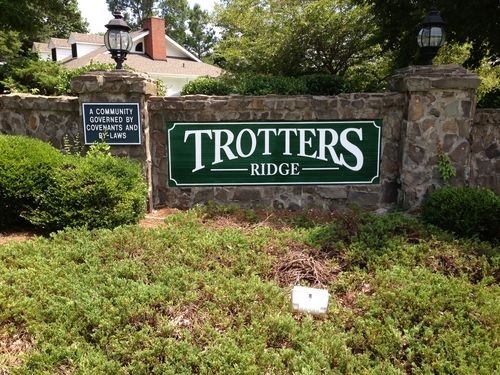 Additionally, Trotters Ridge is located near Pine Forest Country Club. This gives homeowners the opportunity to have country club amenities since membership is available to non-residents. Trotters Ridge home values are protected by Trotter Ridge Covenants and Restrictions .